I can’t avoid feeling surprised whenever I come across teenagers and youngsters trying to solve the world around them, and I also can’t stop thinking all we’ve built so far, are toys about to be transformed into game-changing tools. 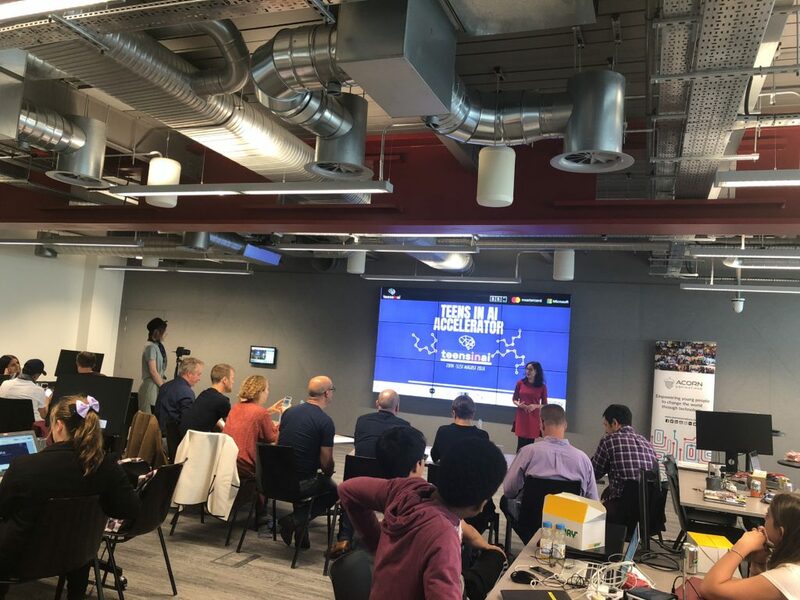 It’s my second time with Elena & Team, mentoring, speaking and this time just listening to the ideas coming out of a two week accelerator programme created with Microsoft’s Reactor in East London. The format is pretty simple…in theory – 20/25 youngsters between 11 and 18, brought together in teams (they’d never met before), and taken through 10 days of Design Thinking, Visioning, Coding and Pitching, using technology and the help of mentors and the team at Acorn Aspirations, to create a few things: A concept that solves a problem, a plan, a demo and a pitch. This pitch then happens on day 10, and it has a panel of judges deciding on the best concepts. The victory for me is seeing this process unravel in ambitious ideas, driven by unconstrained thinking, and executed without fear of failure, but with purpose like most large corporations are only beginning to uncover. Out of the pitches (I’ll update with a link for the official concepts and winners), there were a few key ideas that emerged, that I’d like to share and debate with whomever ends up reading this. The platforms large businesses see as play (youtube, facebook) have an opportunity to serve a huge purpose. Youtube, can be turned into the world’s visual learner wikipedia, and play a fundamental role in education. One of the teams created such a concept, leveraging crowdsourced collaboration to rate youtube content. The risk of this not happening is they can fail an exam question because of an inaccurate youtube video. The tools we today see as entertainment, have a huge opportunity to power the democratisation of personalised learning. It was interesting to see an evolution from many other hackathons with regards to how the solution is presented to it’s users, AKA, the channel. The knee-jerk reaction is to build a chatbot or an app, but these teams approached many of these using browser extensions, leveraging API and platforms to apply the intelligence of their concept on the edge, rather than trying to convince users to flock out of their channel into a website or an app. Good solutions and especially Artificial Intelligence is suffering because of the technical and scale challenges the current channel strategies ensued by organisations presents – I won’t even go into costs… A few teams presented their solutions as a browser extension or a youtube add-on. Even with some commercial challenges to be solved, ecosystem plays will force the hand of the FANGS of tomorrow to embrace, orchestrate and empower small groups of people to solve all of the challenges preventing this revolution to occur. I get slightly annoyed when technology experts need to show off their skills in questioning the way the code is put together, when every idea addresses a big problem future generations will be (and sometimes already are), struggling with. Coding and Data Science are bound to be commoditised and ultimately automated – so stop trying to make it all about them. Solving for relevance, authenticity, meaning and impact across media, content, education, pathological classification and minor skin conditions are all problems of the masses, with potentially billions of humans impacted and could if combined together, tip the scale of sustainability of systems like the NHS. One team had an initial idea that didn’t convinced them, and when contemplating the possibility of having to pivot, they searched for humanities’ biggest challenges. I am still in awe with the simplicity of the answer. Everyone benefited with the two weeks – great concepts and signs of change to come in both the profile of the disruptors but also in the way they work. It feels like the time for large dominant companies to give way to a wave of disruption coming out of small teams of enlightened and empowered minds, aiming to change one of the problems they are facing regularly. It clearly brings to life the disconnect of the decision makers with the real struggles of youth nowadays. They don’t seem to be struggling with buying a house or a car, they struggle with pursuing their beliefs, improving their communities, and taking care of their mental health, in the world of continuous exposure to fake news, peer pressure and a planet failing to keep up with humanity’s pace. I intend to do my bit in helping these minds find a path to make these ideas a reality, and want to thank Elena, Pete, the Acorn team, Microsoft, BBC, Mastercard, and the other institutions that have been helping make this come to life. This is not about Technology nor AI, it’s about empowering future generations. I believe brands that don’t have a social purpose will probably struggle to have a valued relationship with this army of entrepreneurs headed our way. I’m excited with what they’ll achieve. I’d love to hear how this compares with your experience in Hackathons. PS: Great sharing the afternoon with you Karen – it’s a shame I missed your keynote!